STOCKTON - Tony Hunt was thrilled about the location of his 30th win in the United States Auto Club's Western Sprint division. He was happy he won in Stockton, which is close to his home in the Placer County town of Lincoln. And he has always enjoyed Stockton 99, which he called "a really racy track." Hunt had no trouble navigating the quarter-mile asphalt oval on Saturday, taking the lead on lap 15 and cruising to a win in the 40-lap feature. He also set a new Sprint qualifying record of 12.615 seconds at Stockton 99. "It's always great to come here, and it was important to me to win my 30th race in this division here," said Hunt, who had family and friends attending the race. "This is a close race for us. When you can sleep in your own bed, it's close." Hunt also competed in the Midget race, finishing fifth. "I just always like running here. There's a lot of tracks that have just one lane, but this track gives you options to make it two wide and make it more exciting for the crowd," said Hunt, 39. He took the lead by going low on the track and underneath Scott Pierovich, who was second. Tim Skoglund was third. Chad Nichols of Colma held off a strong challenge from Nick Chivelli of Manteca to win the fifth USAC West Midget main event of his career at Stockton 99 Speedway. He also won the event in May, and Chivelli was second. He led all 30 laps, but Chivelli, 17, always stayed close and waited for his chance to make a move. It didn't happen, but Nichols was aware of his presence. "I heard him there the whole time," said Nichols, 33. "We were a little bit loose, so I knew we had to keep it straight so we could save our times until the end. I knew someone was knocking on the door." Chivelli was hoping to earn his first Midget victory at the track closest to his home. "We were there, but the car loosened up and he got away from me," Chivelli said. Cody Gerhardt won the Focus Midgets feature, and Garrett Peterson's car tipped over on lap 26 of the 30-lap race when his car flipped in turn No. 4. He was not hurt and continued in the race, finishing fifth. Chase Grigsby (Baby Grands), Cody Thompson of Fremont (Jr. Focus Midgets) and Danny Allen (Mini Cup) won their main events. On Saturday, July 17th, the NASCAR Whelen All-American Racing Series continued their summer break, but there was still plenty of action at the Speedway in the form of Open-Wheel Racing including USAC Western Sprint Cars, USAC Western Midgets, USAC Ford Focus Midgets, USAC Jr Ford Focus Midgets, WSRA Baby Grands and Mini Cups. The USAC Western Sprints were back in action for their second appearance of the Season. It doesn’t take long for these four-wheel rockets to complete a circuit on the slippery high-banks at Stockton. And each time they do, electricity fills the air. The conduit for the electrical charge on this night would be Super-Star Tony Hunt (56) of Lincoln, who would reach yet another milestone in his illustrious career. This one got underway with Shauna Hogg (5) of Citrus Heights and Scott Pierovich (14) of Alamo sharing the front row and bringing the field around to greet the green. With the green flag waving above, Pierovich got the holeshot and held strong until lap 7 when Al Harney (25) and Jerry Kobza (93) made contact between turns one and two which brought with it the first and only yellow on the night. Unfortunately, neither car was able to continue. On the single-file restart, Pierovich reclaimed his position up front while Hunt maneuvered his way into second. On lap 14, Hunt had worked his way underneath Pierovich and next time by, Hunt had captured that much-coveted real estate out front where he would remain, quite comfortably, over the next twenty-five laps when he drove beneath the checkers for the winner’s share of a battle well fought. This would be Hunt’s 30th USAC Victory in his storied career. Pierovich held on to finish a reasonably close second with the #15 of Tim Skoglung hanging tough to finish on the podium in third. Luis Ramos III (21) of Clovis, after running an extremely steady race, finished the night in fourth while Rohnert Park’s JoJo Helberg (3) brought her home convincingly, in fifth. When the USAC Western Sprints are in town, the USAC Western Midgets will surely be close at hand. These speedy little hotrods always deliver in the form of poetry in motion. Tonight they used their poetic licenses to put on an impromptu show of magnificent talent and sheer determination led by Chad Nichols (17) of Colma, who determined early on this would be his night to go wire to wire to victory. Nichols started on pole to bring this one up to speed with Robby Josett (2) Agua Dulce alongside. Unfortunately for the rest of the field, Nichols got a great start as the green flag flew and he grabbed a huge hunk of forward bite and was gone like the wind with the only thing out his windshield being the checkered flag waving in Victory. The race for second was a little more dicey, but when the dust settled, and the scoring loop was no longer active, it would be HomeTown Favorite and Stockton’s own Nick Chivello (27B) outgunning the rest of the field to finish up in the number two slot after simply running out of time to overcome Nichols. Alex Schutte (25) of Redding, after mixing it up early on with Chivello, crossed the stripe in what was a very close third. Josett fell off the pace, but only slightly, to finish up in fourth with USAC Sensation Tony Hunt (4) of Lincoln bringing home a top five. 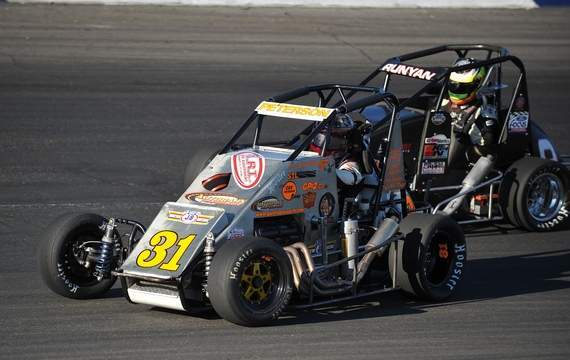 The USAC Ford Focus Midgets bring their own flavor to the tricky-quick quarter-mile at Stockton. It’s a flavor easily digestible and extremely addictive as was seen on this night in front of a crowd of nearly 500. And, to be sure, Cody Gerhardt (40) of Madera was the icing on the cake with his late-race charge to the checkers. This one got up and running with Courtney Atkinson (3) of Franklin, WI, nabbing the number one slot and Cody Thompson (8) of Fremont flanking her to the right. As the green flag flew, so did Thompson as he jumped out front to show his strength early on, despite the stunning battle waged on him by Garrett Peterson (31) of West Sacramento over the first several laps until lap 6 when Peterson overwhelmed Thompson with the tenacious pressure applied from the outset and Thompson had no choice but to relent. Once out front, Peterson appeared too strong to succumb to mere pressure, but, on lap 40, Gerhardt put together a magnificent move through three and four and powered by Peterson for the lead where, once there, it was smooth sailing to the finish line and the win for Gerhardt. Thompson moved quickly to fill that number two hole and that’s exactly where he would finish. The #60 of Tim Skoglund, after a very solid run, finished on the podium in third with Keegan Walmer (24) of Portland, Or, finishing fourth and Peterson, after a strong early and middle race, making up the top five. The youngsters of the USAC Jr. Ford Focus Midgets are pretty impressive in their unadulterated, youthful style. But don’t let the youthfulness fool you, these kids are serious about their racing. Of course, the outcome dictated Cody Thompson (8) of Fremont was the head of the class tonight as he dominated this one through to the finish. Brandon White (11) of Eureka and Courtney Atkinson (3) of Franklin, WI paced the field to green to get this one going with White jumping out to lead the first lap only to be displaced by Thompson the next time around. From that point forward, Thompson was virtually in a race by himself as the #8 continued to yard the field until he met the checkers on lap 25 with a half-lap lead on the second place finisher who happened to be Keegan Walmer (42) of Portland, Or. Atkinson fell back a bit, but still landed on the podium in third with White slipping back to finish fourth. The WSRA Baby Grands debuted on the Toughest Test In The West tonight and Chase Grigsby (14) of Rio Linda proved to be too tough to handle as he headed the field early on and never looked back. This one got up to speed with Lincoln’s Jarrett Kelly (6) and Grigsby controlling the front row until lap 6 when Grigsby wrestled the lead away and away he went, spearheading the field while maintaining complete control of each lap thereafter until he crossed below the checkers to the sweet taste of Victory. Kelly, after a great door to door battle with Grigsby, held on to finish a solid second while David Napier (29) of Scotts Valley brought her home on the podium in third. The #07 of Brentwood’s Patrick Hill finished her up in fourth with Robbie Roy (33) of Sacramento rounding out the top five. The Mini Cups were back in action once again, and once again, Danny Allen (24) of Lincoln, would best the field on this hot summer night. The #5 of Zachery Case started P1 with the #33 of Adrian Wilson at his side. Case jumped out to the front when the green flag went waving where he enjoyed the untampered air until lap 7 when Allen squeezed below him and took control of the situation out front bringing the #23 of Mt. View’s Tommy McCarthy along for the ride. Once there, Allen drove off to the checkers despite the constant gnawing at his back bumper by McCarthy, who had to finally settle for second at the stripe. Case slipped back just a bit, but still managed a solid finish on the podium in third. Jackson Ezell (15) of Lodi and winner of their most recent race, finished fourth with Bryce Napier (03) of Scotts Valley finishing in the number 5 spot. Next Saturday, July 24th, come join us at the Speedway as the NASCAR Whelen All American Series, after a two-week summer break, roars back into action with the Western Late Models in Twin 40s, Grand American Modifieds, Street Stocks, Bombers, and Basically-4-Cylinders.